A bunch of delicious, vibrant cilantro. And it didn’t cost me an arm and a leg. Since I had lots of limes left over from the lemon lime cake I made a few weeks ago, I knew the first step would be to combine the cilantro with lime. 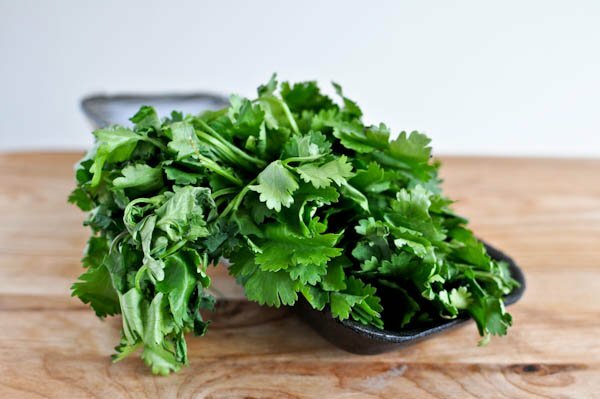 Cilantro reminds me of delicious Mexican food (my favorite cuisine! ), which in turn reminds me of margaritas. I could use a margarita considering there is a hefty amount of snow piled outside my window. And because I have a dangerous hummus obsession, I knew some form of the bean dip was on the agenda. But after I dumped nearly all of the ingredients into my food processor, I realized we were out of olive oil. Totally out. Luckily, I instantly remembered that I had some persian lime olive oil leftover from my shopping trip this summer. Love. Apparently I’ve got Mr. How Sweet hooked on hummus all of a sudden. Turns out that beans are on his okay-to-binge list, which means that my favorite tub of hummus is lasting only about 4 hours these days instead of 24. It’s forcing me to make it at home now much more often. Plus, he doesn’t smell so hot. And he is still forcing me to eat brownies. How dare he. Combine beans, cilantro, lime zest, juice and garlic in the food processor and blend until mixed. With the processor on, stream in olive oil until desired consistency is reached. I blended mine for a good 3-4 minutes to make it super creamy. Season with salt and pepper to taste. Serve with pita chips! Gotta go! My cabana boy will be here any minute with my margarita. What Mr. How Sweet Eats In A Day. Did you season it with salt and pepper? I did. Sea salt and ground pepper. I made this recipe and kind of combined it with this one http://www.shutterbean.com/guacamole-hummus/ last night. Turned out so delicious!! Will totally make again! Now why haven’t I thought of this? LOL Great recipe. Just whipped it up 5 mins ago! I couldn’t even wait for the flavors to merge. Y U M M Y !!!! Next time I may try it with roasted garlic….for guests, but I’m a big fan of the fresh too! I just made this for Super Bowl Sunday and it’s delicious!! My husband loves it! Just made this and it was super good! I made this yesterday for a little get together we were going to and it was a huge hit! It was fabulous! I served it with some little pita bread crackers from Trader Joes. Delish! I will definitely be making this again! Pingback: cilantro lime white bean hummus « HummusAmongUs. LOVED this! Made it Wednesday night and now I am making it again tonight! (Friday)it is sooo good! I don’t remember how I found this recipe but this is my 3rd or 4th time using it and I always love it! YUMMY!!!! Thank you!!! Just made this and we <3'd it!!! I kept it in the fridge for about 2 hrs before serving it and the flavor that developed was just perfect! So happy to have stumbled upon your recipe just when i had all these ingredients! I will definitely have to try this. A note about the brownies – I use applesauce instead of oil, and they are great! A slightly different texture, but not a problem.